10 Things That You MUST Do if Your Dog is Dehydrated! When the sun comes out it’s a reason to celebrate, for both humans and canines. After all, dogs love this weather as it’s an opportunity to bask in the sun’s natural rays, feeding their bodies with the Vitamin D that isn’t produced naturally. There is a dark side to all this, though: dogs cannot tell when they have had enough sunlight and leave themselves prone to dehydration. This can be tricky for owners, as we’re never quite sure how to react. What do we do is we suspect that our dog is dehydrated but won’t drink? How to we rehydrate a vulnerable puppy, quickly? How often should we provide water to a dog in the sun? Should we use Gatorade instead, in an attempt at quenching their thirst? Read on, and we will answer all of these questions and more besides. If you suspect that your dog’s electrolytes are imbalanced due to too much time in the sun, here are ten ways to safely rehydrate your dog. 1 Is Dehydration in Dogs Really a Problem? 1.1.2 Is the Temperature Too Hot for Dogs? 1.1.4 Is Your Dog is at High Risk of Dehydration? 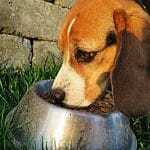 Is Dehydration in Dogs Really a Problem? Yes! It may not be discussed quite as much as various other health concerns, but dehydration in dogs can be a major concern. Just like humans, more than two-thirds of a dog’s body is made up of water, so any issue with this fluid can have an extremely detrimental impact upon their health. If caught early enough, and professional intervention takes place, the chances are your dog will make a full recovery from dehydration, wagging their tail and terrorizing the mailman again in no time. Ignoring the symptoms of dehydration, however, can be fatal. On paper, this is a simple one. 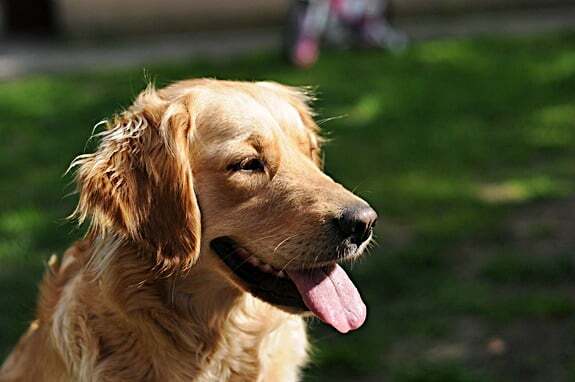 Moderate your dog’s time in the sun, don’t take them out in particularly hot and humid conditions, never leave them in the car, and ensure that he or she is consuming plenty of fresh, clean water. If you’re out and about for the day, pick up a collapsible water bowl for dogs on Amazon. This will fit in your pocket and will ensure that you will always be able to offer a refreshing drink to your pooch. It is absolutely critical that we stay on top of this as pet owners. 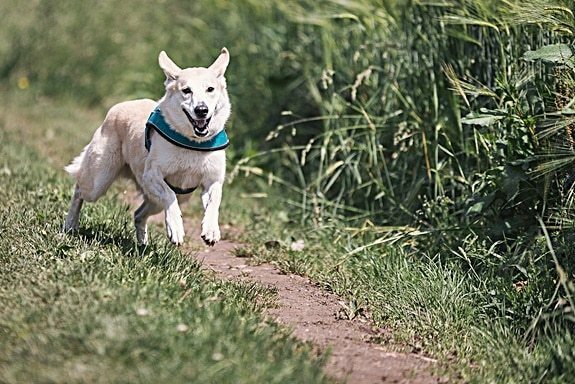 When dogs are out and enjoying themselves they may be too excitable and distracted to remember to stop for a water break, so the responsibility falls to us. Is the Temperature Too Hot for Dogs? If you are thinking about heading outside but are worried that it might be a little too hot out there, spare a thought for how it will feel for your dog. You might be concerned about how uncomfortable you’ll feel, but Fido also has a fur coat to contend with – and no shoes to protect his paws from the burning asphalt. 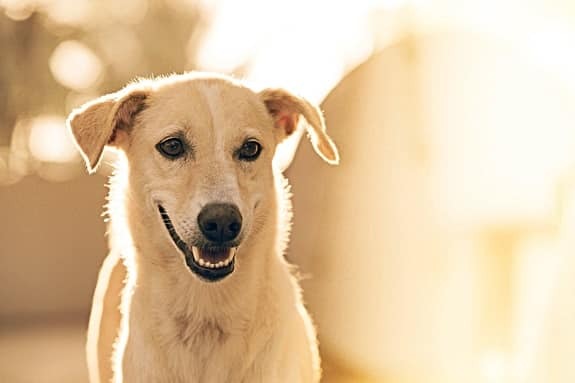 With dog’s chests being so close to the ground, and the rays of the sun scorching the pavement and onto dog’s tummies, sunburn and dehydration are very real concerns during the summer. Important: If you don’t have access to a shady spot to walk through, according to Vets Now, you should place the back of your hand on the asphalt for around seven seconds. If this is too hot for you and you feel as though your hand is burning, then it’s most certainly too hot for your dog’s paws. Despite this, don’t make the mistake of failing to exercise your dog at all while it’s hot outside. This means that will not become thirsty, and will not drink any water. This is highly dangerous when the sun is so hot in the sky. As always, balance is key – ensure that your dog is getting out for a brisk walk, preferably early in the morning before the sun had had an opportunity to really heat the sidewalks, or later at night after sunset. These are magnificent inventions that will moderate your dog’s natural body temperature. A self-cooling mat for a dog is simple to use – just place them on a dog bed or cushion, and as Fido lies upon the cooling mat it will automatically cool off to roughly seven degrees below room temperature. It’s the perfect tonic for a hot and bothered pooch that has concluded a walk outside in a heatwave. Is Your Dog is at High Risk of Dehydration? Some dogs are more likely than others to suffer from dehydration, and the consequences could be more severe for these particular pooches. No single breed is more likely to end up dehydrated than another, but if your dog is elderly, diabetic or recovering from another illness such as cancer, you should be particularly vigilant about ensuring that they are drinking enough water. If your dog has been under the weather for any reason, keep a close eye out for any of the symptoms of dehydration (outlined below). Many health conditions could leave a dog with diarrhea or vomiting, and both of these symptoms could leave a dog severely dehydrated having drained them of critical fluids and minerals. Sometimes dehydration in dogs is its own problem, and sometimes it comes as a side effect of another, different health concern. As we have already mentioned, issues such as vomiting and diarrhea can lead to dehydration as your dog’s body is ejecting essential fluids and minerals faster than they can be replaced. 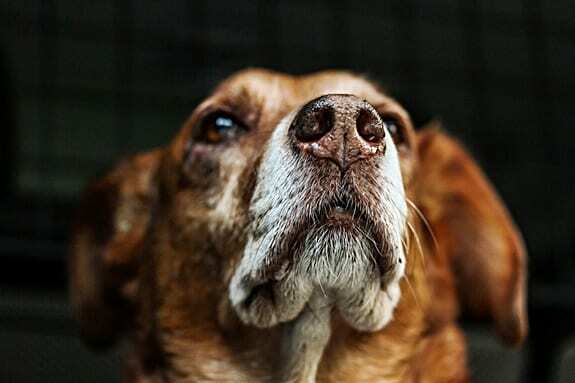 You should also keep an eye out for changes in the color of your dog’s urine, gums that appear to have changed color. If you suspect that your dog may be dehydrated based on the symptoms above, you can conduct another test. Very gently pinch the flesh on the back of your dog’s neck using your thumb and forefinger. If your dog is dehydrated, his or her skin will lack elasticity – meaning that the skin will take quite some time to revert back to its usual shape. If this is the case, and it’s out of the ordinary, your dog is most likely dehydrated. You should take immediate action to prevent any irreparable, heartbreaking damage occurring. Now that you can recognize the symptoms of dehydration in your dog, you can start the process of attempting to treat the problem. This advice should come as standard, but it’s hugely important when it comes to dehydration in dogs. Yes, there are a variety of remedies that you can use at home that we’ll discuss shortly, but it’s imperative that you get your dog to a vet ASAP. This will enable a professional to assess the damage, and advise further on exactly how to proceed. In particularly severe cases of dehydration, your dog may need to stay with the vet for treatment. This will often take the form of an intravenous drip of fluids, which will slowly but surely get Fido back to his old self. On the other hand, it may be good news, and the diagnosis is not too frightening. If this is the case, your vet will send you home with a set of instructions as to how you can treat your dog’s dehydration, no doubt many of which will be similar to what you’ll find below. One thing is absolutely clear, though, and cannot be stressed enough; if your dog is dehydrated, you must consult a professional. Don’t take alternative treatments as a solitary source of action – use the advice that follows while you are waiting for your appointment to make your dog as comfortable as possible. Just like humans, doggy dehydration is caused by an imbalance of electrolytes in the body. 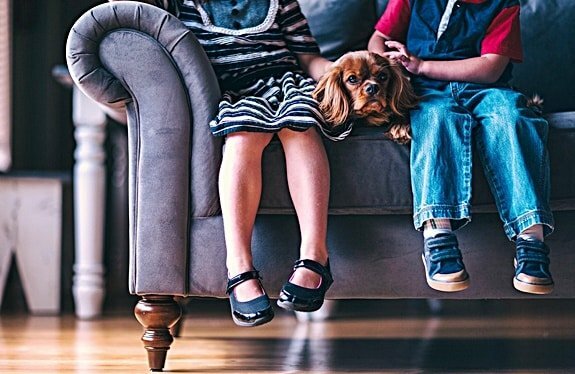 Pedialyte is a supplement designed for human children, but it’s also suitable for dogs. Just mix Pedialyte in with your dog’s water bowl and encourage them to drink. 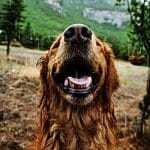 Chicken or Beef Broth will be filled with electrolytes, and the strong, meaty smells will encourage your dog to get stuck in. This could also be a way of encouraging a poorly pooch that has lost his or her appetite to ensure they are getting some essential nutrients from food, even if it is in liquid form. Just ensure that the shock of changing diet to something non-solid doesn’t cause diarrhea. This sounds counter-productive. If your dog is dehydrated, surely they need more water, not less? The truth is, it’s important that a dog that is dehydrated to enjoy a high consistency of water intake. It may be tempting to lay down a bowl that’s filled to the brim, encourage Fido to drink heartily, then repeat the process. This will not help as it will just cause your dog to bloat, and they’ll eliminate the water almost immediately through urine or vomit. If your dog is dehydrated, encourage them to drink in moderate amounts with more regularity than they ordinarily would. Instead of leaving a full bowl of water and allowing your dog to lap at it until it’s empty after eating, only fill around a third of the bowl and encourage your dog to drink from it with more regularity. If necessary, lead your dog through a little very light exercise so they’ll develop a thirst – even if it’s just trotting up and down the stairs. This will help your dog to get the fluid they need, on a consistent basis. You’ll still need to see a vet in case an IV drip is necessary, but this regular intake is certainly more beneficial than guzzling water twice a day. If your dog simply will not drink water from their bowl, it may be time to look into an alternative way of getting them hydrated. One way of doing this is to grab a syringe from a local drug store and filling it with water. Encourage Fido to open wide, and squirt the water straight down his throat. Your dog may not like this at first, but all being well it will give them a taste for hydration and they’ll soon start sipping at their water bowl again. Another possible way of encouraging your dog to drink by hand is to fill a plastic bottle, and again squirt and squeeze that water straight to the source. If your dog is dehydrated, there is every chance that they’re feeling sorry for themselves and want some attention from their owner. This ‘hand-feeding’ of essential fluids may be just what they need. Conventional wisdom dictates that a dehydrated dog should have ice cubes dropped into their water, as the extra cold fluid will rehydrate them faster. Sadly, this is a myth – and a dangerous one at that! While it’s true that dropping ice cubes into your dog’s water bowl may encourage them to come and investigate, and they may find the ice water refreshing, ice water does more harm than good when it comes to treating dehydration. The reason for this is that icy water makes the stomach contract, which obviously means that the fluid is not moving as freely throughout your dog’s body and organs. If anything, this will leave Fido more dehydrated, not less. Dogs enjoy ice though, so what can we do? The simple solution is to provide a dog with ice cubes – just not within their water. Your dog will enjoy licking at the ice cube, gaining relief and hydration from the ice, without contracting their stomachs by guzzling down an excess of cold water. Also, over time this may encourage your dog to lap at their bowl of room temperature water. It’s a win-win! While human beings gain and lose the majority of our body heat through our heads, the key to regulating a dog’s temperature is their paws. Have you noticed that even the most water-averse canines can’t resist a splash and paddle in a river or stream on a scorching summer’s day? This is because the cool water on their paws is hugely soothing. You can recreate this sensation at home. Just fill your bathtub with cool (not ice cold – that will just send your dog into shock and create a whole new set of problems) water, and very gently encourage Fido to step inside. All being well, you’ll find that your dog will quickly realize that this is helping and stay put. Your dog may lower himself or herself into the tub and decide to stay put, submerging their bellies in water for a little more relief from their high-running temperature. This will not cure dehydration, so you’ll still need to get your dog out of the tub and to the vet as quickly as possible. It should, however, cool your dog’s body temperature to a more comfortable level, which may encourage them to drink a little more water and take the first steps to recovery themselves. Starving a dehydrated dog will not do anybody any favors, but equally, a pooch suffering from this condition should have their solid food intake limited. To re-affirm, this doesn’t mean taking your dog’s food away. However, you will be better served by allowing your dog to graze the same quantity of food that they would usually enjoy in smaller portions across the day. If your dog usually eats one meal per day at night, try splitting their allowance into two servings, one in the morning and one in the evening. If your dog eats twice, make it four times at regular intervals. Conversely, this four-meal approach is probably the best approach to aim for eventually. Don’t just leap into it if your dog usually eats one substantial meal a day, as he or she may wonder why they are being punished for being poorly and go hunting for additional nourishment elsewhere. Of course, you could also try adding some different foods to your dog’s meal that have high water content – or, if you are understandably averse to experimenting with human foods while your canine companion is already under the weather, try some wet dog food as per the advice below. 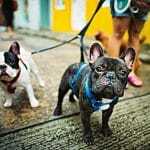 It can be quite dangerous to switch up a dog’s diet without any kind of warning, as this can lead to stomach problems. With diarrhea being a major factor in dehydration for dogs, the idea of serving up wet food to Fido may seem like it will do more harm than good! Like all things, however, taking action in moderation can be hugely beneficial. As long as you don’t make a sudden, complete change to a dog’s diet, they should be able to cope. This means that if your dog usually tucks into a bowl of kibble, trying picking up a quality brand of wet food and making the ratio 90/10 in favor of dry biscuits, then 80/20, 70/30… you get the picture. As we have just established, if your dog is at risk of dehydration they should be eating little and often. This will help their stomach adapt to the change of diet gradually, and prevent a rebellion. If you don’t have the time to pick up wet food from a pet store and you’re worried about your dog, there is an easy workaround – add a little water to their kibble. Not too much or your dog will find the meal unappealing and refuse to eat, but just enough to bring a little moisture into Fido’s diet. Sometimes, it may be prudent to mix a homemade rehydration solution for your dog. This will typically be a little more impactful than plain water when it comes to improving the performance of your dog’s internal organs, and it may spark at least the beginning of a revival following a bout of dehydration. There are a vast variety of different remedies that can be found all over the internet, and please allow us to stress that we are not vets so cannot officially endorse any of them. There is one particular remedy that did catch our eye, however, posted on the website Animalwised. It’s up to you if you decide to use this particular remedy, and if you do, ensure that you also seek professional help and advice – this is not a miracle elixir that supersedes the advice of a vet. Give everything a stir, allow the water to cool to a safe temperature, and serve it to your dog in their favorite water bowl. This should go at least some way of replacing their lost water ahead of catching up with a vet for further advice. That’s right – it may sound a little crazy, but if you are concerned about the impact of a homemade dehydration remedy, vets have approved the use of Gatorade to rehydrate a dog. Hey, if it’s good enough for professional athletes it’s good enough for Fido, right? This sports drink is particularly helpful to your dog if they are dehydrated following a bout of diarrhea, and it should only ever be used as a temporary pick-me-up. What’s more, don’t just empty the full bottle into your dog’s bowl and expect the Gatorade to work wonders. The electrolytes contained within (yep, those again) will benefit your dog’s body and help stave off the worst symptoms of dehydration – but the average pooch has a significantly smaller body than us. This means their doggy organs are also smaller than their human counterparts and will struggle to keep up with the same stimulation as us. The average bottle of Gatorade is packed with sodium and sugar, which if consumed in large quantities can lead to further health complications further down the line. One way around this particular problem may be to heavily dilute the Gatorade, making a 50/50 concoction that is half water – and try not to make a habit of serving it, lest Fido develop a taste for this tasty beverage and start to decline water in the future. Can You Catch a Stomach Virus from a Dog?